The one word that keeps popping into my head is "addiction". I know I am addicted to food. I have grown up around countless drug addicts and even a few alcoholics. Including my ex-husband. And so many times I feel so frustrated at them because I just couldn't understand why they can't stop. Even with interventions, family support, medical intervention... you name it. And they won't stop. Even when it means death. Even when it means losing everything they have. They can't/won't stop using. I feel like I understand that struggle right now. I have all the tools, and I was doing so well. But something happened last week, and I just started sliding downhill on my face. And I still can't seem to get it together. Saturday night, after two long days at a region wrestling tournament (where I ate badly the whole time), I had a meltdown while trying to explain to my Love how frustrated I felt. How out of control I am. And how bad I hate being fat. Why can't I just keep it together? Why can't I stay in control? I swear I want it... but I guess just not bad enough. I am discouraged, and very disappointed in myself. But I am not going to give up. I have 2 1/2 more months as a Slim-Fast ambassador, and I will get 40 lbs off by my birthday if it kills me! I know it's not too late... I just need to get it together. I am going to pray about it tonight. Hard. And if you are they praying type, please pray for me, too. I think the important thing here is that you acknowledge your problem ans are working towards your goals. It is hard work. Honestly, I have been craving a burger for the last 3 days and I am this close to giving in. I know it is not good for me but I can not seem to shake off this craving. it is hard work, it is a constant struggle and you are not alone. Best of luck, there are people who are hoping for your success so keep at it ;). I too share with you in this weight loss journey, but we will get it done! Hang in there, God gives us a new beginning. I feel your pain but in a different way. I come from a family of addicts. Drug addicts, alcoholics, just general self destruction. My mother is anorexic and my dad loved food. He was not overweight but he was definitely a person that associated food with gratitude. For example he saw someone cooking him a huge dinner as love... whereas my mother saw it as a struggle. Now I'm stuck in the middle. I cook to show my kids and my husband I love them. I could seriously open a restaurant with the recipes I come up with, and can bake or cool anything. Its genuinely one of my greatest gifts. BUT, I can't eat. I'm not anorexic by any means but I lack the "okay" part. I go from one extreme to another... 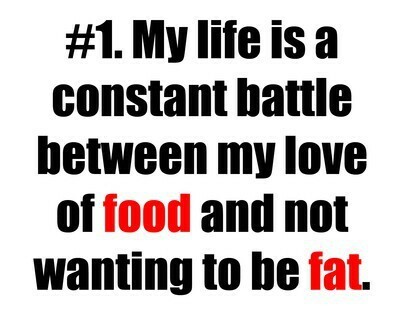 I either mope around all day and binge on everything I see... or I workout from morning to night and starve myself. I don't have a healthy in between. If I treat myself to one piece of dessert, I beat myself up about it and jump right into calling myself fat and putting myself down. But on the other hand if I starve myself, all I can do is talk about numbers... calories consumed... calories burned... how long till I'll be my goal weight... what pants size I am. The big difference between an addict that won't/isn't able to stop and you, is that they are in different frame of mind. You know what you're doing and that's a good step in the right direction. I also adore food and I can tell you that the craving is strong. Don't give up. It's a lifelong journey. Hollie I am so sorry you're struggling. I am too. It is DRAINING to constantly fight this battle. And when we give in and eat junk it is a RELIEF because for that moment, the battle stops. But in the long run, we have to learn a new way to get that relief... one that does not involve food. You will get there Hollie. I believe in you. I haven't grown with addicts, but I know your pain about your own own struggle. I have been battling my own addiction to food for at least 10 years without much success. There is the feeling o helplessness and even self hate because I fgeel like I am weak. I know I am not weak and neither are you! You can do it and so can I. You can do this...I know you can. Praying that God shows you the truth behind the addiction. I completely understand what that's like. I think we all feel that way at some point on a weight loss journey. I suffer from "I'm not there yet?!" syndrome. I'm convinced I should be there by now! This is a timely post for me. I have had the same in my life (drug addicts and alcoholics) and see the same patterns with me and food as them and their "drug" of choice. I also watch Intervention and see many similarities with drug and food addiction. Maybe you could set up some mini goals instead of focusing on "I have to lose 40 lbs" I want to lose 35 lbs. by Sept. and I am counting it in 5 lb. increments. We are here to help and listen Miss Hollie and we all have faith in you!!! I will keep you in my prayers! I too struggle with exactly what you blogged. I don't understand why this is a constant battle. I've asked God what is the purpose of this battle? 'Lord, bless Hollie-Father open her heart, mind and soul as to Your purpose for this struggle in her life. Enlighten her with Your will for her life and any realizations she may need to acknowledge and deal with. Britain’s Best Boot Camp is a boot camp that allows you to achieve what you want – with the luxury of a hotel, good food and spa treatments. Boot Camp it certainly is – you’ll enjoy the exercise – but Boot Camp de luxe – in the most beautiful part of the South. I feel for you and wish it wasn't so hard. I was a decent weight all my life and then I turned 50! Now, it's pretty difficult to keep my weight in control. I need to lose about 80 lbs. I went back to the gym recently. I do cardio, sit ups and work out with weights. I'm determined to get it off, tho I know it's a slow process. Now, if I could only do something about my love of carbs. It's the sugar, processed foods, and fats that are bad for us. I'm trying to eat more fruits, vegetables, and grains as God intended - not all that fake stuff. But it's so hard. I will keep you in my prayers. Its so hard i got five kids always been slim even after each baby.but i went into a bad depression,and got real big.and it kills me i starve my self and i no its a bad thing.. So sad i understand i a mom of 5 im 30 years old i always been slim now im fat and .i hate my self so much.i throw up,won't eat .i cry i hate my self..wat could i do??? ?